No one is born a master. This rule does not only apply for blue collar workers and Formula-1-Drivers. It suits for Poker Players, too. A lot of practice needs to be done in order to become real good at Poker. If you’re new – no matter how brilliant you are – it is best to look out for a weaker competition and a mobile poker App that is made for recreational players rather than pros. You don’t have to look for a “Poker for Beginners App” by yourself. Our editorial team has already done all the hard work. Here is the list of the best real money Poker Apps for recreational players and beginners. Talent is also important – sure. You need to have a favor for maths or a least a good “feeling” for statistical chances if you want to become a winning poker player and make it to the top. But intelligence is not everything. Poker is so much more. At a certain level, Poker Players play the opponent rather than the cards. You need pretty much experience to read your opponent – experience that is gained in losses. And on a real money table a loss means to lose money. Poker for Beginners means to gain experience without paying to much money. Therefore you need the right poker room and the right App. This article is not about all the odds and outs, tipps and tricks you need to learn – there are more than enough book teaching you that. This article is about choosing the right poker room for beginners. Yes, there are quite a lot differences between – lets say – PokerStars and 888. Unibet is one of the operators who take care of recreational players. On the one hand there is the usability. Many bigger Pokerrooms are trying to attract more experienced and therefore valuable players. This can perfectly make sense for them. Pokerpros and amateurs spend a lot of time on their hobby. And the more time they spend playing poker, the more money the operator makes. 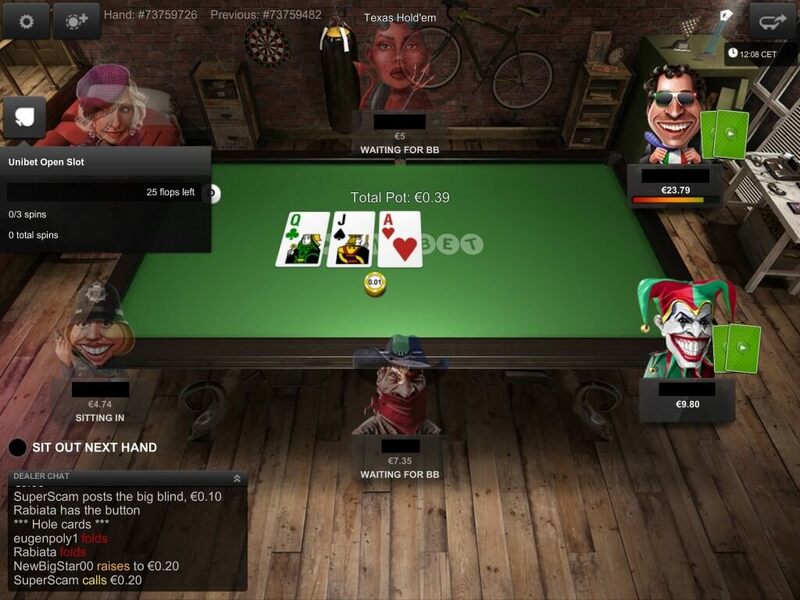 These Pokerrooms – like PokerStars – offer a huge number of tables and a lot of poker variants, features and settings even within their mobile poker app to make the players happy. Less experienced players can be overwhelmed by the pure number of tables and settings and choose the wrong ones – simply because they do not know better. On the other hand there is the level of your opponents. You want to learn from the best? Sure. But do you really want to pay more than neccessary? It is not the best choice to jump into a pond full of sharks beeing a tasty fish. Especially if you’re bleeding. Poker-Sharks are really good at picking weaker players. It’s how they make their money, basically. So it might be kind of a strategy to avoid these shark-basins as long as you are not able to bite back. So, what exactly should you look at? Comfort features – quick seating for example – make it more easy to get started. Anonymous Poker tables are important, too. If the opponent doesn’t know your name, he doesn’t know how you played before. This makes HUD-Pokertrackers somewhat useless. And therefore equals the chances a little more. Fast Fold Poker is also great for Poker Beginners. Because you are seated at a new table everytime you fold your hand, it is much harder for sharks to “hunt” you. Plus, Fast Fold Poker is less boring to play, making it less likely that you do stupid things just to be part of the action. A pretty new trend, established in 2015 and 2016, ist Jackpot Poker. This poker variant, where the prize pool is determined by a wheel of fortune before a quick tournament begins, is also very popular amongst beginners. And then there is the looks: the better the graphics and the more animations within the app, the less attractive it is to pros. They like it pure and do not want to be distracted. So they might gi somewhere else.